Come discover a people-powered regeneration that's bringing food back into the commons for all to enjoy for free. 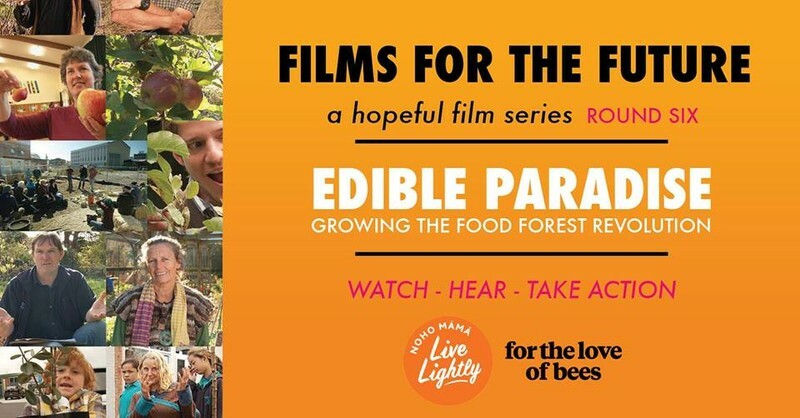 At this screening, we'll share how For the Love of Bees is collaborating with folks in Christchurch to support their mission of creating an Edible Garden City - a dream that will be made possible by a healthy and diverse pollinator population! For the Love of Bees is excited to be collaborating with Live Lightly, Ellen Melville Centre and Lily Hirsch to bring you Round Six of our Films for the Future - A Hopeful Film Series. This series offers you a movie experience partnered with the chance to meet a local hero working on a real project in your town. You will learn a real skill on the night that you can take away and implement immediately. Get Inspired - Learn - Take Action. Captured over five years as part of the Localising Food Project, Edible Paradise shares the dream of greening post-quake Canterbury by saving valuable heritage fruit and nut varieties from the bulldozers. The project tries to ensure that genetic diversity, medical benefits and historic links will remain available to future generations. The film takes us to the four corners of Aotearoa to meet local food campaigners instrumental in creating community orchard and food forest projects in their patch. A Food Forest is a collection of perennial plants grown in a multilayered natural forest ecosystem that is beneficial to humans, animals, plants and insects. More details on the hear, learn and act to come! Bring a jumper just in case it gets a bit chilly. Some of the seats can feel a bit firm after a while, so you're welcome to bring a cushion.